Lori Desrosiers’ debut full-length book of poems, The Philosopher’s Daughter was published by Salmon Poetry in 2013. 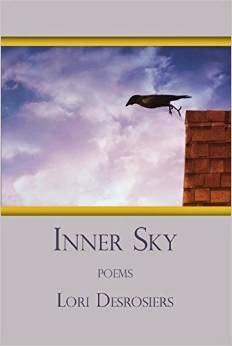 A chapbook, Inner Sky is from Glass Lyre Press. A second full-length collection, Sometimes I Hear the Clock Speak, will be out from Salmon in 2016. Her poems have appeared in New Millenium Review, Contemporary American Voices, Best Indie Lit New England, String Poet, Blue Fifth Review, Pirene's Fountain, The New Verse News, The Mom Egg, The Bloomsbury Anthology of Contemporary Jewish-American Poetry and many other journals and anthologies. Her work was nominated for the 2015 Pushcart Prize. She won the Greater Brockton Poets Award for New England Poets award for her poem “That Pomegranate Shine” in 2010. She edits Naugatuck River Review, a journal of narrative poetry. 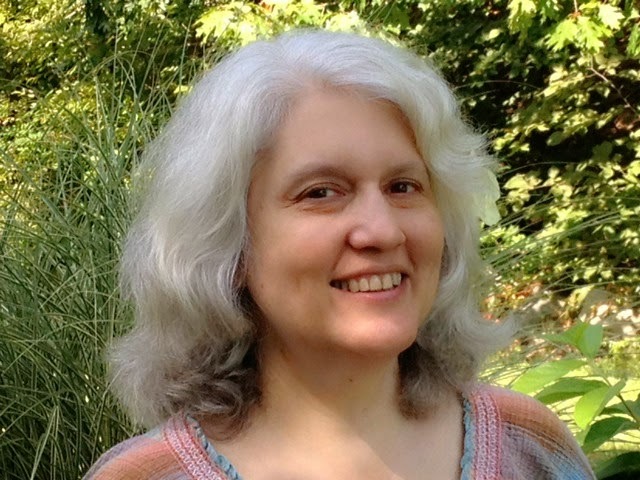 She teaches Literature and Composition at Westfield State University and Holyoke Community College, and Poetry in the Interdisciplinary Studies program for the Lesley University M.F.A. graduate program. I met Lori in person at an AWP conference when I read at an off-site reading she set up for contributors to the Naugatuck River Review. It was held at an Irish pub in Seattle and was grand fun. Lori is active in supporting poets and poetry, so when I heard she had a new chapbook coming out of poems related to domestic violence, I jumped at the chance to interview her about it. But before proceeding to the interview, as a way of introduction to Lori's work for those unfamiliar, here is one of her poems from the book. NCL: Please tell us a little bit about your upcoming chapbook. LD: Inner Sky is a book about surviving domestic abuse. The voices in the book are based on fact, but are not all autobiographical. The poems expose some of the issues typical in abusive situations such as control, enabling, anger and gaslighting. It is also about leaving, and finding strength and help. I’m hoping these poems will be helpful in some way to others who are going or have been through a similar situation. NCL: In Gregory Orr’s Poetry as Survival, there’s a quote by Muriel Rukeyser “I don’t believe that poetry can save the world. I do believe that the forces in us wish to share something of our experience by turning it into something and giving it to somebody: that is poetry. That is some kind of saving thing, and as far as my life is concerned, poetry has saved me again and again.” In a Writers Chronical (May/Summer 2014) interview with Leslie McGrath, Camille Dungy said “For me, writing about myself, my family, and my home is a political act. It’s not just confession, it is confronting erasure.” Did you find either one of those be true for you while you were in the process of creating your poetry, and in the sharing of it with others? , and if so, could you elaborate? NCL: What difficulties or challenges did you encounter in writing some of the poems? in publishing the collection? LD: These poems were hard for me to write, in that I had to dig deep and revisit traumatic episodes, not only in my life but in my children’s as well. I spoke at length to my daughter about publishing this book, and got her permission to do so. One thing that was hard for me about writing the poems themselves is, because of the content, I was reluctant to send them out individually, but they seem to work well as a collection. NCL: Did you ever regret including a poem or not including one? NCL: Audre Lorde wrote “I write for those women who do not speak, for those who do not have a voice because they were so terrified, because we are taught to respect fear more than ourselves. We've been taught that silence would save us, but it won't.” Was activism one of the purposes or goals of the chapbook, e.g., giving voice or increasing awareness? If so, could you tell us a little more about that. Have you given a reading of the poems in the chapbook, and if so, what has been the response? NCL: In her essay “Reading the Living Archives: The Witness of Literary Art” (Poetry, May 2011), Carolyn Forché wrote “In the poetry of witness, the poem makes present to us the experience of the other, the poem is the experience, rather than a symbolic representation.” I imagine one would need a great amount of empathy to write a poem that makes present the experience of another. Could you speak a little to the process of creating poetry out of another person’s story or testimony? LD: These are mostly poems gleaned from personal experience, but some are also inspired by other women’s stories from when I was in support groups after my second divorce. I’ve never thought of myself as greatly empathetic, but when you have gone through the same experience, it is easier to find a common language, even to the extent of being able to finally identify patterns and tendencies to abuse before a relationship even begins. LD: There certainly were other aspect of the experience I could have written about, but I felt these poems were enough for now. I think a chapbook is a good length also for my purposes, which are to facilitate some writing workshops and to share the book with other women trying to heal from domestic abuse. I have many other topics I write on. For example, my second book, which will be out from Salmon in 2016, is mostly ekphrastic poems in response to music. NCL: What’s one of the more crucial poems in the chapbook for you? (or what is your favorite poem?) Why? How did the poem come to be? LD: I decided to share the next-to-last poem in the book, under the third section, “Awakening.” It is entitled “The Ice Crow.” The image of a crow with whitened wing seems to me to symbolize the spirit of transition, in this case between death and new life, which is what a person goes through after a trauma. We gradually shed our winter trappings, but still leave black footprints in snow, still carry that cage on our crooked backs. Nevertheless, we hang up the “gone fishing” sign and hope to lay down the burden of our pain. NCL: In addition to the subject of domestic violence, what are some other themes, metaphors, and other elements of craft did you use to unify your chapbook? LD: These are also poems of time and place. They are very much set in the 1980’s (one refers to New Wave music) and are set in Long Island and in Connecticut. I varied the pronouns (some are in third person) on purpose, to give several voices and perspectives to the reader, and to also soften the tone in places where a first-person narrative would have been too painful. NCL: How did you arrive at the title? give her power to another again. LD: I think others might be interested in the fact that I went back to school at age fifty for my M.F.A. Sometimes we have to be brave and take a risk to reinvent ourselves. LD: I have been busy promoting my books as well as teaching and mentoring students. My journal, Naugatuck River Review, which publishes narrative poetry, will be open for contest submissions in July. I am also working on a new online journal, Wordpeace, which is dedicated to peace and justice and features prose (fiction, non-fiction) and poetry in conversation with world events. I am also writing as much as I can, and am very grateful to be member of two critique groups, who inspire me regularly, and because nobody should have to write in a vacuum. Nancy Chen Long received a BS in Electrical Engineering Technology and an MBA, worked as an electrical engineer, software consultant, and project manager, and more recently earned her MFA. As a volunteer for the Writers Guild at Bloomington, she coordinates the Lemonstone Reading Series and works with other poets to offer poetry workshops. Her chapbook, Clouds as Inkblots for the Warprone (2013) was published by Red Bird Chapbooks. You'll find her recent and forthcoming work in Superstition Review, DIAGRAM, Mason's Road, Sycamore Review, Boxcar Poetry Review, and other journals.